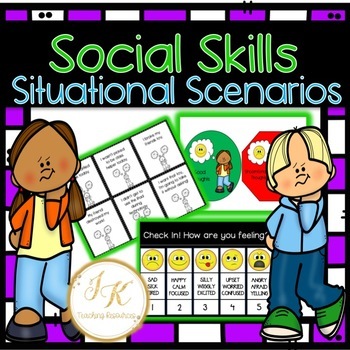 Zones of Regulation-Social Skills Situational Scenarios PLUS Check In! As teachers in special education classrooms, we saw how our students commonly struggled with self-regulating and identifying emotions which negatively impacted their social skills. We needed something to be able to help them as well as improve behavior management. We began researching different resources to try with our students, that could help them better regulate how they were feeling and Zones of Regulation by Leah Kuypers quickly became something that we used faithfully. It has shown to be very beneficial in our classroom and it has vastly improved communication with those students who struggle with vocalizing and recognizing their feelings. 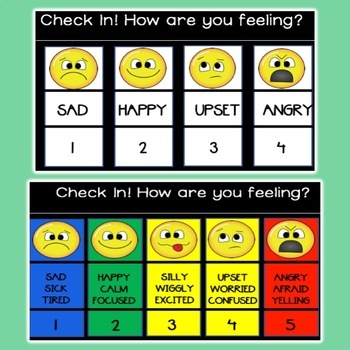 "The Zones approach uses four colors to help students identify how they are feeling in the moment given their emotions and level of alertness as well as guide them to strategies to support regulation. By understanding how to notice their body’s signals, detect triggers, read social context and consider how their behavior impact those around them, students learn improved emotional control, sensory regulation, self-awareness, and problem-solving abilities." 1. Two different “Check In” anchor charts: We use these with our students to help them recognize the emotions they are feeling. Especially those that are non verbal. They do a check in to show (or tell) what zone they are in. Includes picture emotions and descriptive words for each zone. One is more simplified for diverse learners. 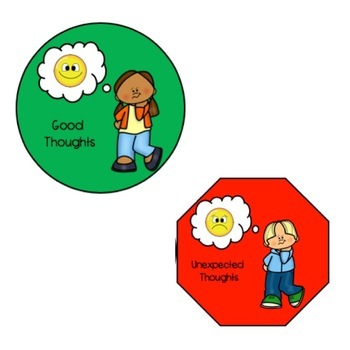 Red Sign with Bad or Uncomfortable Thoughts: We included two different red signs for teachers to use depending on their preference of word choice. -Print, cut and laminate (if preferred) the signs and different scenarios. Each student gets a green sign and a red sign. Turn all the scenario pieces face down on the table. Student’s take turns picking one piece and holding up the sign that represents that situation..
**A low prep idea is to print just the scenarios pages and have students color or circle the face that best represents the situation. Check out our included preview above for further clarity and examples of what is included. Please click on the ⭐ above to "Follow Us" and receive updates on new products and free downloads when they become available. ⭐ Social Studies; Community Helpers BUNDLE! Worksheets, Centers, Games Plus MORE! ⭐ Sentence Building Literacy Center Activity - Build, Print, Draw!